In a small garden plot south of Nairobi, Kenya. March 2013. 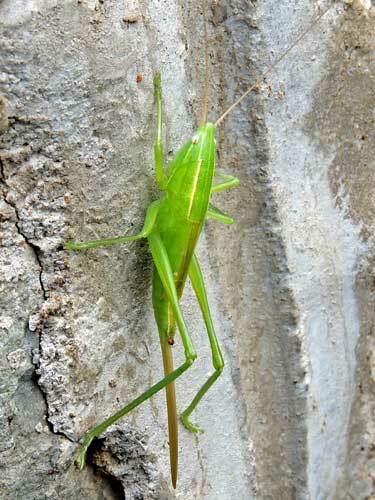 This appears to be a common katydid of highland agricultural settings in Kenya. I have found it in small gardens in Nairobi and Eldoret. The color may be brown or green. The males can make noise by stridulating - dragging a hardened ridge on one wing across pegs on the other wing. 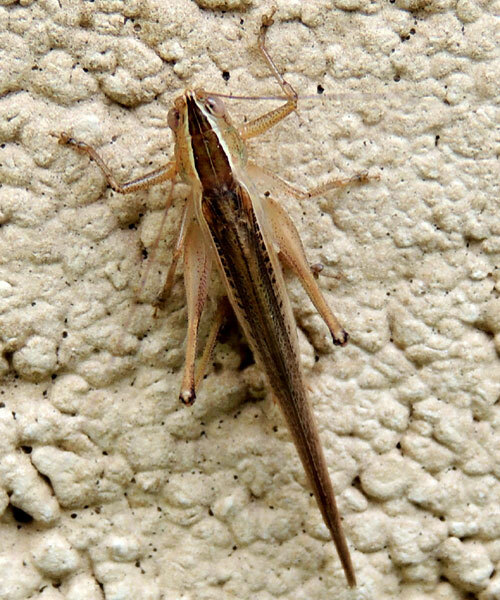 Females (example below) have a long, sword-like appendage for depositing eggs deep in soil, etc. It appears that this is a female, green morph, of the same species. In a garden at Eldoret, Kenya. July 2014. Copyright Michael J. Plagens, page created 25 Oct. 2014.